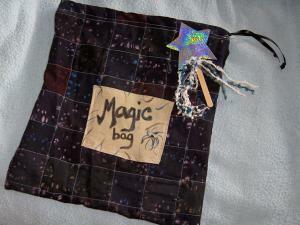 We made a super-quick drawstring bag for the “magic bag”. We put a black ribbon through it for the tie. Next came the cool-i-o magic wands. Stars were cut from Crayola sparkly paper and glued together and to a popsicle – I mean craft – stick. So easy, fast and fun. We added a magic trick with instructions – “Up, Up and Away”. It’s all about lifting a dime with a straw, so those were included as well. 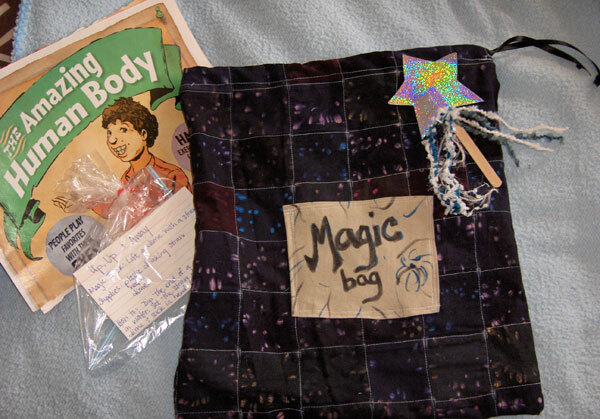 I had an extra Family Fun magazine from our library discard pile, so we put in the article about all the neat tricks our bodies can do. Oh my, an educational present. lol. I did have the thought that it would be fun to make 4×6 layouts of the magic tricks and print those out – all colorful and whimsical (and inexpensive to boot). Maybe for a future birthday. I can think of two little boys that wouldn’t mind this present.